Are dogs really dirtier than humans? 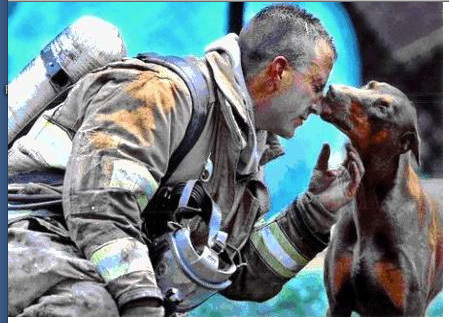 As this dog tends to a firefighter emerging exhausted from an inferno, canines everywhere consistently perform similar deeds of astonishing tenderness and loyalty . In what ways are they a germ-spreading risk? Researchers at the University of Florida at Gainesville have discovered a protein called Nerve Growth Factor (NGF) in saliva. Wounds that were treated with NGF actually healed twice as fast as untreated wounds, indicating that if a dog does lick a human’s wound, it could in fact lead to a faster recovery. In addition, Dr. Nigel Benjamin, a clinical pharmacologist with St. Bartholomew’s Hospital and the London School of Medicine and Dentistry, has conducted research indicating that when saliva comes into contact with skin, a natural component of saliva called nitrite, breaks down into nitric oxide, a chemical compound that is very effective in protecting cuts and scratches from bacterial infections. There are some dangers of letting a dog lick a deep open wound, so always take precautions. The anaerobic bacteria called Pasteurella is found in dogs saliva as well and can cause serious infections when introduced deep into an open wound. Although the healing properties outweigh the negative impacts, there will always be a number of injuries which are best treated by cleaning with soap and water, then covering with an antibiotic cream and a bandage. Children who play in parks fouled by dogs can indeed catch a specific disease from dog faeces, so hand-washing after contact with the soil is the rule. The fact remains that dog’s saliva has antiseptic properties, unlike that of a cat, which harbours germs. Man’s evolution has designed him to navigate the eco-system of all these earthbound fellow-travellers. Alternatively, he attempts to seal himself from all birds, mammals and insects. And dust. And air. Man is more prey to diseases carried by other humans than by other, simpler, inhabitants of his environment. His immune system is the greatest success-story of the species. In the balance of nature, it is time to give dogs a break and return some of their time-honoured friendship. We can start by shunning the practice of using “dog” as an insult. Instead, we welcome their healing services. And we wash our hands of undue fears.